With all that red from the previous post, I thought I would stick with red for a while longer. But then I sat down with some polymer clay and that was the end of sewing for a while. Partly because the polymer work was hours and hours of fun, but also because I didn’t have a specific sewing project lined up. I realized the other day that I don’t sew if I don’t have a plan for what to sew next. So I’ll have to come up with a sewing plan. On Saturday, while out and about with my husband, I found these cool placemat inserts at the local Bernina dealer. The inserts are precut, with rounded corners, and fusible. Awesome! My set of four also came with some applique/embroidery designs but I didn’t use those. I thought about it at first but then I remembered these pretty fabrics that were a travel souvenir from a trip in 2014. 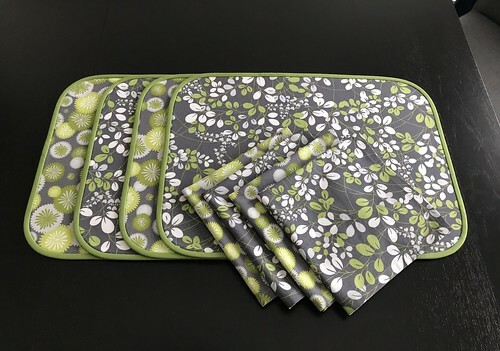 I had a yard of each, which was just enough for these four placemats and four napkins, using a yard of a different fabric for backing. That’s 3 yards for this project, bringing my running total to 23 yds. I’m not counting the solid Kona cotton that I cut up for the bias binding – it was a remnant from a 2013 project. The fusible inserts made the job easy. The whole project was very enjoyable and provided hours of Zen-like peace. I might make placemats more often, hehe. I cut the napkins 18″x18″ and hemmed them with a half-inch double-turn hem, mitered at the corners. Easy-peasy. And that’s all I have right now. Next time I’ll show you some polymer earrings I made last week.